SPOKANE, Wash. – U.S. News & World Report, in its annual college rankings, ranks Gonzaga University the 4th best regional university in the West for the third straight year and the No. 7 best value – up from No. 13 last year. Gonzaga’s School of Engineering and Applied Science is the 19th best (tie) engineering program nationwide (at engineering schools whose highest degree is a bachelor’s or master’s). Gonzaga ranks No. 2 in the West for its (2016) graduation rate of 84 percent and is No. 3 for its average first-year student retention rate of 93 percent. First-year retention indicates the average percentage of first-year students entering from fall 2012 through fall 2015 who returned the following fall. The graduation rate indicates the average proportion of a class earning a degree in six years or less; the publication considered first-year classes that started from fall 2007 through fall 2010. Gonzaga’s No. 7 best value ranking among regional universities in the West is based on its academic quality ranking and the 2016-17 net cost of attendance for a student who received the average level of need-based financial aid; 53 percent of Gonzaga undergraduates received need-based grants in 2016. Gonzaga ranks as No. 3 among the West’s best universities for both undergraduate teaching (tie) and for students who are veterans (online only). Gonzaga also ranks high in the publication’s measure of the academic quality of incoming first-year students with 69 percent of first-year students who entered in the fall of 2016 ranked in the top 25 percent of their high school class. This marks the 19th consecutive year that Gonzaga has been ranked among the top four regional universities in the West, and the 23rd consecutive year (30th in the past 33 years) it has been ranked among the best regional universities. Gonzaga’s overall ranking is based on several key measures of quality, including peer assessment (22.5 percent), retention and graduation rates (22.5 percent), faculty resources (20 percent), student selectivity (12.5 percent), financial resources (10 percent), the difference between predicted and actual graduation rates (7.5 percent) and alumni giving (5 percent). The regional universities classification includes 659 institutions in four broad regions: North, South, Midwest and West. Like national universities, regional universities offer a full range of undergraduate majors and master’s programs; a primary difference between regional and national universities in the rankings is that the former offer few, if any, doctoral programs. Gonzaga offers doctoral degrees in leadership studies and nursing practice as well as a juris doctorate from the School of Law. Gonzaga’s mission-focused care for individual students is evidenced by its 12-to-1 student-to-faculty ratio (fall 2016). Only 2 percent of Gonzaga’s classes include more than 50 students (fall 2016) and 40 percent of Gonzaga’s classes include fewer than 20 students (fall 2016). 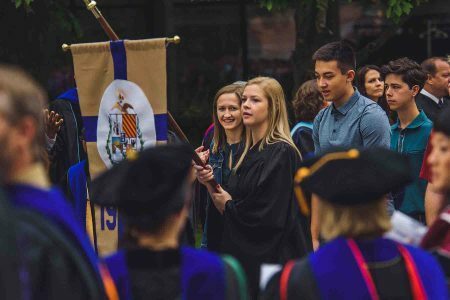 The publication notes that the difference between its “predicted graduation rate” of 76 percent and Gonzaga’s actual graduation rate of 84 percent indicates the University is enhancing student achievement. Affirming the quality of Jesuit education, four of the top seven regional universities in the West are Jesuit institutions. The rankings are available online http://www.usnews.com/colleges and will be in the print edition of the “Best Colleges 2018” guidebook. To learn more about Gonzaga University, visit unfold.gonzaga.edu.